Ah the Holiday Season! What's more exciting than this part of the year? I am sure we all wait this season right form the starting of the year! With Thanksgiving just over, its time to get ready for Christmas! And with X mas, we are all for buying winter wear..especially sweaters. Somehow we tend we associate X mas with some ugly holiday sweaters. Remember Bridget Jones diary? I somehow, don't feel that all those typical red, green and reindeerie sweaters are ugly. Do you? Santa Sweater: What is Christmas if not wearing a Santa? The sweater is black and hence not too 'ugly'! Is not the print too cute? 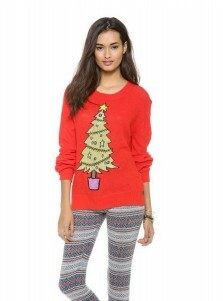 Christmas Tree Sweater: The way adorning Santa is mandatory, it applies the same for an X Mas tree too! What I love about this print is that the tree is yellow! How unique is that? 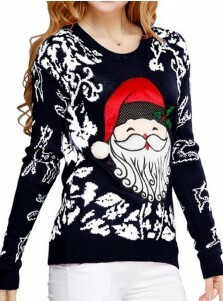 Dark Blue Sweater: I just adore the dark blue color and the twin Santas are too cute to resist! So what is your take on ugly Christmas sweaters? What kind do you like wearing?